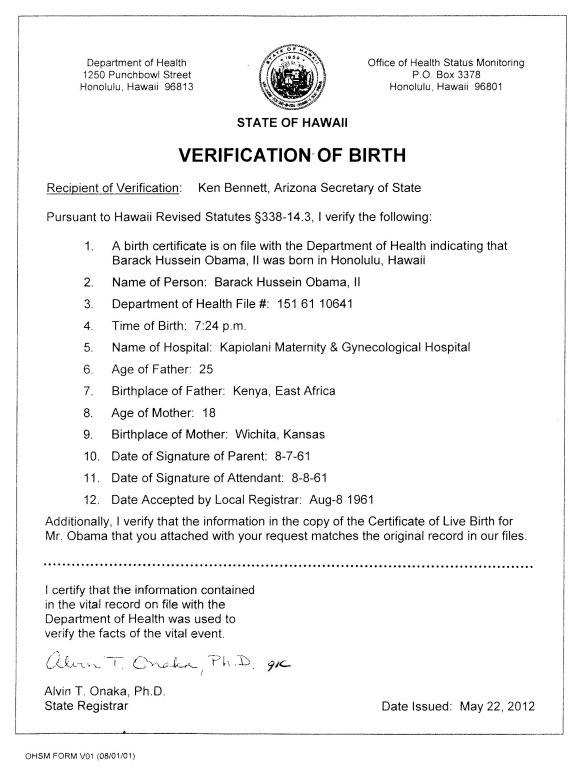 …Also that Obama’s mother gave birth to him overseas and then immediately flew into Hawaii and registered his birth as having taken place in Hawaii.Again, any clarifications on this? Defintely disqualifies him for Prez. There must be some trace of an airticket. While small babies are not charged air fare they do have a ticket issued for them. 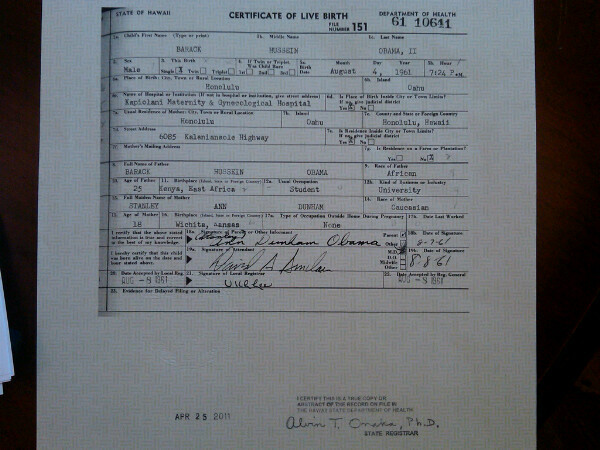 In response to Internet rumors that his middle name was “Mohammed,” the Obama campaign released a copy of his birth certificate in June of 2008 (showing his middle name is “Hussein”). Nevertheless, a growing number of people began to believe the rumors, particularly among Hillary Clinton supporters, and it was not until a Clinton supporter found the 1961 Honolulu newspaper notice of Obama’s birth that this group largely abandoned birther theories. However, one Clinton supporter, attorney Philip J. Berg, continued to promote these theories, and filed a lawsuit in federal court (Berg v. Obama et al.) to prevent Barack Obama from running for office. 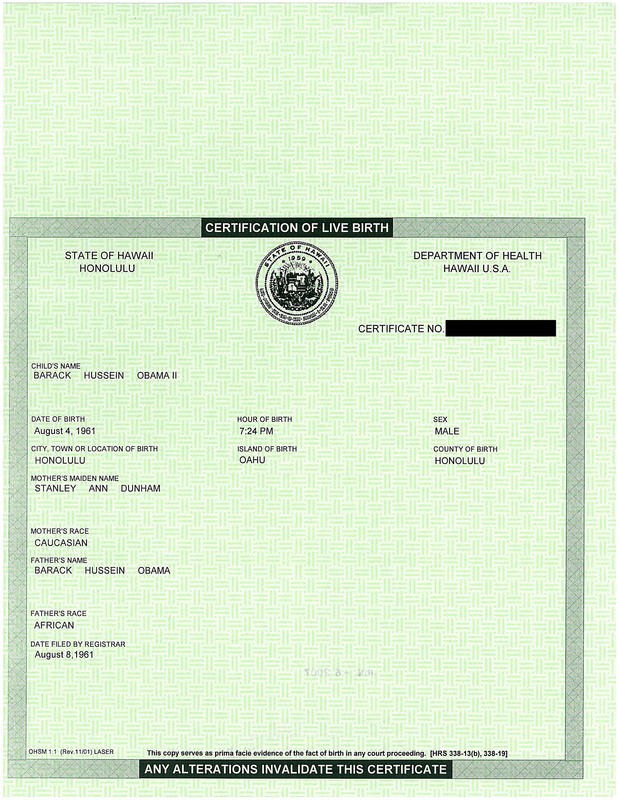 A major component of the “born in Africa” theory is an attack on Barack Obama’s birth certificate, the official state-issued computer abstract birth certificate, the “Certification of Live Birth.” A number of non-credentialed Internet researchers declared the birth certificate a phony, but no authority has agreed. During the 2012 presidential campaign, maybe candidate Donald Trump generated significant media attention to his questions about Obama’s birth, claiming to have sent investigators to Hawaii. No results of that investigation were ever published, but the White House did respond by releasing the so-called long form birth certificate from Hawaii, containing additional details, including the name the doctor who delivered Obama and the name of the hospital where he was born. 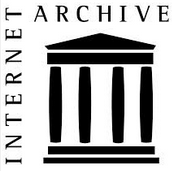 The long-form birth certificate was released by the White House as a PDF document, and again non-credentialed Internet researchers declared it a fake, again no authority has agreed. The second prong of objection to Obama’s legitimacy is based on the fact that his father, Barack Obama Sr., was not a US Citizen. The theory, created by New Jersey attorney Leo C. Donofrio, says that the phrase “natural born citizen” in the Article II constitutional requirements for the President, means someone who was born in the US to two US citizen parents. Those who hold this legal theory largely base it on an 18th century legal treatise titled in English, The Law of Nations, by a Swiss jurist named Emerich de Vattel. While all the courts that have looked at this question deny any parental requirement for US Presidents, Donofrio’s theory is widely held by birthers to this day. The fourth objection is based on a copy of Barack Obama’s Selective Service registration form obtained from the Selective Service System through the Freedom of Information Act in 2008 while George Bush was still president. A number of objections to the document have been leveled and generally refuted and fallen by the wayside. 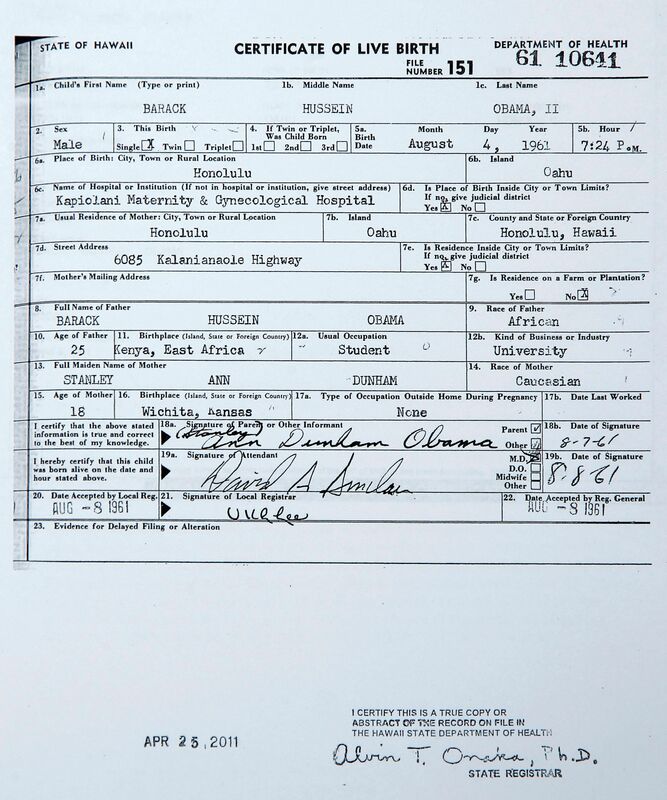 The one objection remaining is that the post office stamp on the document is missing the century digits of the date, and this, say the birthers, proves that it is a forgery. The Selective Service System has responded by saying that Obama was properly registered. There is a federal law that denies federal employment to persons who failed to register with the Selective Service and some birthers think this applies to the Office of the President. This article covers only the most basic concepts about birthers. The Obama Conspiracy Theories web site contains over 3,000 articles about birthers, and even it is not complete. 1Collins, Loren, “The Secret Origin of the Birthers,” Barackryphal.